Mozart wrote the role of the Queen in The Magic Flute for his sister-in-law Josepha Hofer, who was famous for her outstanding vocal technique and high notes. The Queen of the Night’s two dramatic arias are accordingly packed with fiendish coloratura, taking the soprano voice to amazing heights, particularly in the Act II aria ‘Der Hölle Rache’. Elena is one of several roles that Rossini wrote for his first wife Isabella Colbran. Colbran had an exceptionally wide vocal range and the writing for Elena spans the gamut. The opera culminates in one of Rossini’s greatest showpieces for the female voice: Elena’s virtuoso Act II aria ‘Tanti affetti’. 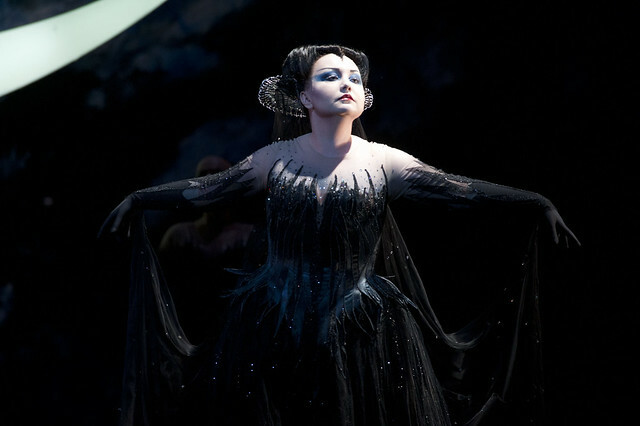 Norma requires immense stamina, vocal agility and (particularly for the aria ‘Casta diva’) lyricism and beauty of tone. But the challenges don’t stop there: the singer also has to convey the varied and intense emotions of a heroine torn between religious devotion and jealousy, romantic passion and maternal love. Lucia is another role that makes huge demands on a soprano’s stamina: she has to retain enough energy through the demands of Acts I and II in order to carry off Act III’s famous mad scene – a breathtaking display containing a stratospheric virtuoso cadenza accompanied by glass harmonica. Abigaille is a notoriously difficult part: it calls for a singer with a powerful, very agile voice who can move from the bottom to the very top of her range at great speed. Even the most lyrical of Abigaille’s arias, ‘Anch’io dischiuso un giorno’, includes a thrilling two-octave leap. Brünnhilde is often seen as a dramatic soprano’s ultimate challenge. She must sound equally comfortable in the high notes of her opening war cry in Die Walküre and in the low-lying passages that punctuate Götterdämmerung. She must be heroic and tender, vengeful and noble. And above all, she must have the stamina to sing in three operas, each more than five hours long! Olympia the doll is only on stage for about half an hour, and for much of that time simply says ‘oui’. But her one aria ‘Les oiseaux dans la charmille’ is a virtuoso tour de force, each verse adorned with ever more elaborate coloratura. The part also calls for comic acting: Olympia’s mechanics periodically run down and stop her mid-flow. At 90 minutes, Elektra is relatively short role – but it’s fiercely difficult. The singer has to project over a vast, intricately-scored orchestra and sing some of the most dramatic, declamatory music ever written for soprano, while also conveying lyrical tenderness in her reunion scene with Orest. She also needs to retain enough physical energy for the dance which brings the opera to its devastating close. Like Elektra, Turandot requires a powerful high voice and a singer able to execute very declamatory vocal writing with ease. The role also poses dramatic challenges: how can a soprano make this murderous princess sympathetic enough to convince us she deserves a happy ending? This near-impossible part requires a singer with a three-octave range who can shift from intense lyricism to flamboyant high coloratura to speech – sometimes within the space of one aria. The character is also dramatically deeply enigmatic, and is onstage for every scene of this four-hour opera. Possibly the highest role ever written for soprano, Adès’s ‘airy spirit’ enters The Tempest singing 17 full-voiced Es two and a bit octaves above middle C – and continues in a similar range for most of the opera. The high notes aren’t limited to coloratura either: many of them are in slow and sustained passages, which is fiendishly challenging. Which fiendishly difficult roles would you include? Lucia di Lammermoor runs 30 October–27 November 2017. Tickets are still available. An absolute treat to listen to - it has given me such pleasure. Definitely Zerbinetta from Strauss´s Ariadne auf Naxos, this is an absolute top of coloratura art, especially in original score. Woman in Benjamin's Written on Skin. Barbara Hannigan was magnificent. Les Contes should not be on this list (just one aria). I agree with most of the rest. Cio Cio San should have been included, at least for her three-hour stage presence and complexity. Have you sung the doll song? But of course! Unbelievable that this list was compiled without the -besides perhaps Norma - greatest soprano role of them all. Salome would be another contender, just as Aida, Traviata, Tosca, Marschallin and on and on. But I think few would argue that Isolde and Norma stand apart. Olympia and Queen of the Night have NOTHING on Gounod's MIREILLE. Have you sung either role? If so, did you actually sing them well? Two omitted roles immediately jump to mind: Violetta Valery (La Traviata), which requires both both consumate coloratura technique and broad lyricism, and Kundry (Parsifal), with its fiendishly difficult tessitura and huge interval leaps. Bach and Handel were almost contemporaries; why Handel composed so many outstanding operas, while Bach did not compose even one opera? Bach tended to write for the voice in the same way he wrote for the orchestra (technically very tricky). I think his focus was on religious sentiment not personal dramas. Handel understood voice/drama and I think he actually prefered writing opera rather than instrumentals (his stint in Italy might have something to do with it and certainly influenced the way he wrote thereafter). Olympia and QOTN don't really have a whole lot of singing...the role everyone forgets for its difficulty (due to sheer length and amount of singing) is Mozart's Susanna! Look no further than Bach's two magnificent Passions and the B minor Mass. both are very operatic in scope and dramatic effect. They are virtually (sacred) operas - minus the acting, costumes and scenery. No it's not A LOT of singing, bit the difficulty of their material makes up for that. Some roles are difficult because they're long and need stamina, others are hard, because their material is wide and varying. For Gosh Sake ... I LOVE IT. I am able to choose one. Thanks for this awesome post. Like your list of fiendish parts, Calvin, but when you list Lady Macbeth, which one do you mean? Verdi or Shostakovich? And I'd also like to include both Frauen ohne Schatten, the Farberin and the Kaiserin! The Woman in Schönberg's monologue opera Erwartung. The role is not very long but it is dramatic, the music is horribly difficult, the orchestra is huge, text very fragmentary, and the singer has to resolve tricky questions on how to interprete this Freudian nightmare. Having sung both, I think this is even more demanding than Elektra. With so many great roles it is difficult to know which to leave out. However Isolde and Salome should definitely be in the top ten. This is great, thank you! What about the altos? After 15 years singing as a mezzo I've now been told I'm an alto. Looking for some inspiration. What about the Empress in Die Frau ohne Schatten (R Strauss)? I would include Act 4 scene I of Il Trovatore. Many thanks for flagging this error, which has now been corrected. A nice set of choices, and I agree with all the comments about them. Maybe one could distinguish between the parts that can be pulled off by a soprano whose voice may not be in the best condition but whose talents as an actress carry the day, and roles that simply cannot be negotiated if the voice isn't in order? For example, the Marschallin or even Lady Macbeth, and possibly Emilia Marty can be hugely successful even if the singer is practically voiceless. I once saw Hildegard Behrens practically speak her way through Isolde and she was still the best ever. (Well, OK ...) But Violetta? Elektra? Manon? The Countess? Donna Anna? How about the Dyer's Wife in Die Frau ohne Schatten? There are certainly plenty of demanding roles. Alcina, Vitellia - both for vocal and dramatic difficulty rather than the non-role of Olympia, where one is required to provide accurate accuti with 0 (anti?) legato and absolutely no personality. Also "Elle" in Poulenc's La voix humaine, for dramatic envolvement. One should include Prokofiev's The Fiery Angel.... The major soprano role is devilishly and extremely difficult. The soprano is required to take on an extreme of emotions of psychoism, and hysteria and has to sing at an extreme high tessitura in a chant-like rhythm fortississimo full blast in the second act. Most opera companies steer clear from the work because it is known as a vocal shredder for a soprano. Pamira in Rossini's "Le siege de Corinthe"
Parisina in Donizetti's "Parisina d'Este"
Ortrud is a bit tricky! Have I missed it, or has no one really mentioned Cenerentola ("Non più mesta") for mezzos? Anna Nicole and Alice in Gerald Barry's Alice in Wonderland. It's very long, she's got lots of arias, coloraturas, LOTS of c's. And a fiendishly difficult aria on the passagio plus cabaletta full of coloraturas and e flats right at the end of it all. Armida by Rossini is extremely complex and difficult. Gemma Di Vergy is for the very gifted and large- voiced sopranos..3 Normas equal one Gemma, according to Caballe, and she should know; she sang Gemma everywhere to great response. I agree on the Gemma Di Vergy as pssibly the most difficult of all soprano parts...many roles close behind of course..but none of Wagner. Tatiana (Eugene Onegin) for dramatism. I am thinking, also, about Melisande, from Pelleas et Melisande by Debussy. I agree Esclarmonde and Isolde should be up there-- those might be the two hardest soprano roles of all. I would also include Madame Mao from "Nixon in China." Pamina's Mom and the Hoffman Doll have no business being here. Isolde (Wagner) and Esclarmonde (Massenet) should be have been included. Salome, Norma, Turandot, Isolde, Abigaille in "Nabucco", Lady Macbeth, Medea,Il Pirata, Armida, Semiramide, Anna Bolena, Fidelio, Elektra, and finally Salome. I went over but couldn' leave these off. Isolde, Turandot should be up there. Violetta in La Traviata. She commands all of the acts and has several of the most difficult and justifiably famous arias in opera. Only the very best sopranos have been able to master the role.